Consul General Ajit Kumar is welcomed by the President of Hyderabadi Association of Atlanta, Mir Faiz Ali Khan, along with Miraj Khan, Dr. Farzana Mumtaz, and Meena Shirjeel. The Hyderabad Association of Atlanta held its annual Eid-ul-Adha Banquet on Saturday, October 18, 2014 at Zyka restaurant. This Eid commemorates the sacrifice of Abraham and Ismael and the annual pilgrimage to Mecca, the Hajj. The dinner was attended by a large group of people representing metro Atlanta, including the Honorable Mr. Ajit Kumar, Consul General of India in Atlanta, and Nivedita Garabadu, President of the India American Cultural Association. The current Executive Committee under the leadership of Mir Faiz Ali Khan, Miraj Khan, Sayeed Sharjil, Meena Sharjil, Saud Khader, and Sara Fatima continues to make tremendous efforts to bring the community together through organizing events periodically. The evening started with a warm welcome of dignitaries and Association members by Mir Faiz Ali Khan, the President: “The Hyderabad Association of Atlanta was founded over 30 years ago by people who had moved from Hyderabad and settled in Atlanta. Over the years it has grown into an umbrella organization for Atlantans who have great values and came from various cities of India. 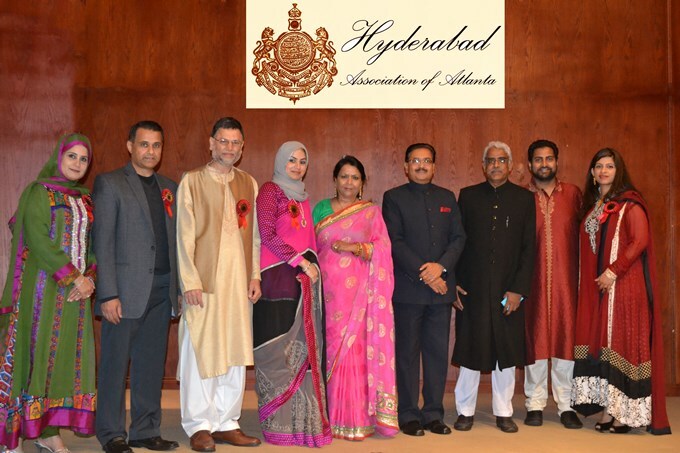 The purpose of the Hyderabad Association of Atlanta is to preserve our heritage in our youth, rich history of Hyderabad, unique culture, literature, and promote religious harmony—one of the characteristics of Hyderabad.” The city of Hyderabad is now the 4th largest city in India and has an estimated population of 8 million. 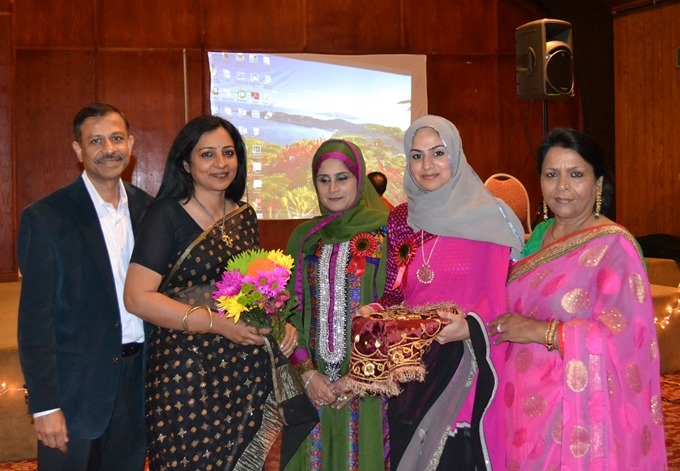 Mrs. Nivedita Garabadu, President of India American Cultural Association, with her husband, together with Meena Shirjeel, Miraj Khan, and Dr. Farzana Mumtaz. Chief guest Honorable Mr. Ajit Kumar spoke, wishing the community “Happy Eid” and praising its efforts to maintain its identity in its new home. He expressed optimism in modern India as it provides a platform for all of its population and thus has the potential to reach global heights. After an authentic Hyderabadi dinner the attendees unwound through midnight enjoying a light entertainment program of Urdu ghazals rendered by a local celebrity, Mr. Azhar Mahmood. Meena Shirjeel, Shirjeel Baig, Mir Faiz Khan, Miraj Khan, Dr. Farzana Mumtaz, Mr. Ajit Kumar, Dr. Moin Mumtaz, Saud Khader, Sara Fatima.